… are always the hardest to make. We all have an inner-knowing – that guide within us that secretly whispers in our ear and tells us what direction to go in life. But do we always listen to it? It is our soul, our intuitive guide, that tells us that something is not quite right. Even though we may know that something is not quite right, we are not always able to make the right choice for ourselves because those choices generally involve pain. No one wants to make the choice that is going to be harder or more painful. Everyone wants to make the choice that is easier and where suffering is alleviated. 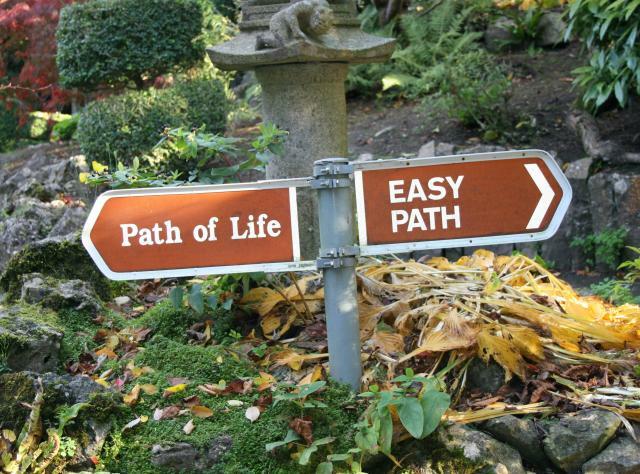 The bigger question in life is do we want to live on the “Easy Path” or on the “Path of Life”. Those who choose the “Path of Life” understand that in the game of life, easier doesn’t win you the race. The highest choices for ourselves are generally the ones that force us to grow and evolve further. Indeed, these high choices may crash us harder and faster BUT they transform into growth and happiness much quicker than the easier choices. On the other hand, the “Easy Path” is laced with easier choices and they are just that, easier. They generally perpetuate an unsatisfactory situation for a much longer period of time. Easier choices have a way of delaying our growth. They keep us in a type of “bliss is ignorance” state of mind or a state of “easeful limbo,” a sort of “calm before the storm”. The problem is that through making easier choices, one takes the easy way out. Now, understand that you can only hide from your lessons for so long. It is just a matter of time before that storm hits full force and you come crashing down to the same place you would have had you made the highest choice years earlier. But this time, the pain is much more severe and there was much more at stake. Why do that to yourself? Why delay your progress? Decisions made to help you avoid pain never work. How do you know when you make the right choice? It feels harder initially, but in the end, you reap far more benefits and you allow yourself to transform and move forward in life much more quickly. Remember, nothing good in life ever comes easy and nothing easy is ever really worth fighting for. What choice will you make next?